A I train 10 times in a week as my sport requires me to be quick and strong. I work out in the gym several times a week with a trainer. We do a combination of upper and lower body exercises. We also do circuit training. A I had a small frame in my younger days. When I started swimming competitively, things changed as I bulked up. The rigorous training schedule plus working out in the gym help me maintain my fitness. I bulked up not to improve my appearance, but because it was part of my development as a swimmer. A I usually have eggs in the morning and I have one serving of meat and one serving of vegetables for lunch and dinner, both of which are home-cooked. I give credit to my mum, who makes sure that I eat properly in order to fuel my training. I don't follow a strict diet. As long as I eat healthy food, it's fine. I rarely have supper as I usually eat dinner late, after training. A My favourite foods include cheesecake, pizza, chocolate chip cookies, fries, bacon and burgers. But I keep my diet in check, as putting on unwanted weight can affect my performance. Q What do you do to relax and how do you maintain a healthy work-life balance? A I love to draw, read, play video games, hang out with friends and, of course, walk my dog. The good thing about my training schedule is that while it is intense, it gives me enough time to enjoy the simple joys in life, like my hobbies. I believe that leading a balanced life helps one perform well in any sport. A My family, relationships with good friends and the luxury of time to indulge in activities that I love. I consider my family and friends as my biggest supporters. I don't think I would have achieved so much if not for them. The full-time sportsman's elder sister, Ting Wen, 23, is also at Rio competing in her second Olympics. Younger sister Jing Wen, 16, is with Swimfast Aquatic Club. Zheng Wen is competing in the 100m backstroke and the 100m and 200m butterfly in Rio. He is the brand ambassador for Liberty Insurance. He said: "Their slogan, Embracing Simple Joys, resonated with me. I believe that living a balanced life, free from worry, is important." As part of the one-year deal, he is appearing on the insurance company's advertisements, website and social media platforms.He will also help run swimming clinics for children in Singapore. A No, I would not consider it as I am happy in my own skin. I believe we should appreciate who we are and how we look. There is beauty in everyone when we look beyond appearances and see them for who they really are. Q What are your must-dos before and after a race or training session? A I always do dynamic stretching (moving the body freely through a range of motions) before I swim, so as to warm up sufficiently. I learnt this from my coaches. It's one of the most important things to do in order to perform well. Cooling down and massages are also important for quick recovery so that I can race again as quickly as possible. A It is extremely important for me to keep up with my fitness routine so that I am able to train at my full potential all the time. It can be exhausting but I believe that hard work pays off in the end. Q What is the most extreme thing you have done in the name of fitness? 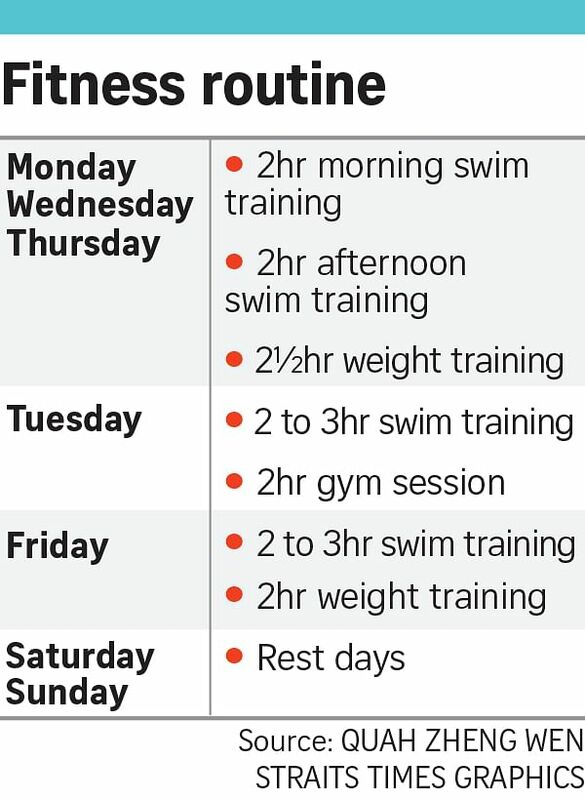 A I think the most intense moment in my swimming career was when I embarked on a rigorous 10 training sessions-a-week regimen. Q What do your friends and family say about your active lifestyle? A My elder sister started competitive swimming before me and she is an amazing inspiration. My younger sister is also a swimmer. I am glad I got into competitive swimming because this is where I have met some of my closest friends. There's a oneness that we feel when we suffer the pain in the water together. Q How extensive is your collection of sports-related paraphernalia? Among them, what is your most prized possession? A As both my sisters swim, we have loads of swim gear. I do not have a most prized possession. The most rewarding thing in competition is when I finish a race and know I did my best. It is even better when that is accompanied by the sweet by-product of being at the top.